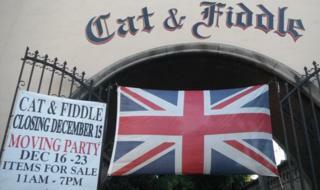 Cat and Fiddle was a home away from home for British ex-pats. This month it closed its doors, and writer James Bartlett was there until the end. When he heard the news, rocker Morrissey wrote a blog post titled "The Earth dies screaming". That might sound a little excessive for a boozer shutting its doors, but the transatlantic transplant was a regular at the Cat and Fiddle pub in Hollywood, a beloved British bastion. It's barely 7pm on the last Saturday before its big gates close for the last time, and it's already standing-room only on the patio, a Spanish Mission-styled area akin to a town plaza that comes complete with a large fountain. Clumps of bearded hipsters, families and a number of people with teacup dogs are all waiting for a plaza table - prime real estate - to open up. When someone stands up, not to leave but to yell a toast, "To the Cat and Fiddle!" he gets supportive cheers. Among the crowd tonight are a number of bright red Santa Clauses - the SantaCon is taking place nearby. "There were 200 in here earlier," says server Mel Karapetian, as she brings a Scotch egg, shepherd's pie and Welsh rarebit to our table, "and that was a bit crazy." Already well into the Christmas spirit is racily dressed Lindsey Robertson from Camarillo, who calls herself "Mrs. Santa's sister-in-law". She and her companion, Jose Avila, who is wearing a very sharp Santa suit more appropriate for a club than a sleigh, are regulars. Avila lives "within stumbling distance" and proudly notes that he has a house account. "This place is family to me," he says, calling the closure "heart breaking". In October, the news of the pub's shuttering was greeted with online rage. There were rumours of conspiracy. When the smoke cleared, however, the explanation for the closure seemed simple yet damning - extensive building renovations and too-high rent. Earlier in 2014 the Cat celebrated its 30th anniversary. The bar's founder, Kim Gardner, died back in 2001, and his twin daughters Ashlee and Camille were now running the place with mum Paula still behind the scenes. As the black and white pictures on the wall inside show, Gardner first came to the US as part of the "British Invasion". A childhood friend of Ronnie Wood, he played bass for the Birds, the Creation, the pre-Faces Quiet Melon, and Ashton, Gardner and Dyke, whose single "Resurrection Shuffle" was a hit in 1971. He met vintage store owner Paula in New Orleans. She only came to Los Angeles once to visit him - and stayed. Frustrated at the lack of a British pub in his neighbourhood, and having little more than an idea and a name, Gardner opened up his own in Laurel Canyon in 1982. "He called it after one of his favourite pubs in Hillingdon where he was brought up," says Ashlee, who added that the name was originally said to have been inspired by Catherine of Aragon, who was affectionately nicknamed "Catherine La Fidele" (the Faithful). Too many raucous nights quickly meant they had to find a new place, and the two-storey Spanish-style Thomson Building on Sunset was perfect. Built by a former TV cowboy star and divided into other units, it once was home to restaurants, a tea room and even a Tiki bar named Mauna Loa. The patio, however, was the star attraction. It was always a place for music - planned or impromptu - and back in the day the sociable Gardner often performed himself. Eric Clapton, Rod Stewart, Ronnie Lane, Wood and many others notable and not-so-notable were soon regulars. Drew Barrymore was a long-term visitor, too. More recently John Hamm and South Park's Matt Stone strolled in, and last year Noel Gallagher, Morrissey and a latte-sipping Russell Brand chummed up for a photo here. Inside, the walls are predictably covered with English paraphernalia - pub trays, signs and bar towels, train timetable drapes, maps, a Union Jack flag and even some antique Vanity Fair sketches from the 1860s. There are some dart boards in back, too - one of which a friend of Morrissey's has been dispatched to buy at the auction of furniture and fittings. On one of the last nights, a group of a dozen jacketed guys - and one woman - stride in. They're The Hive, a moped-loving group based in East LA, who have all just parked outside. One of their members is Marcus Baird, originally from Leeds but a resident here for 25 years. He used to live in the ocean-adjacent Venice/Santa Monica area, home to several other Brit pubs. "We came here today 'cos we knew it were closing down, but it's a great place to hang out, have a beer or two," he says. Speaking just as a TV news crew turned up on Monday, the last night proper, Ashlee was upbeat - despite admitting that she's had to reschedule her March wedding, which was due to take place here. "I was more or less born here," she said, "but we've moved before, back in 1982. We've got some of the old staff working tonight too, and though it's a bit emotional, it isn't the end." She doesn't know who's going to be ringing the silver bell for last call, though. "It might be me, it might be my mom, my sister or the door guy, just like usual."